I have a confession to make …. I’m faking it. I want to be a good mommy. I want to be involved with my son Jake’s life and experience those moments that he’ll always remember (or at least remember for a few days). I really do but this baseball stuff. It’s just bores the freaking crap out of me. There I said it. 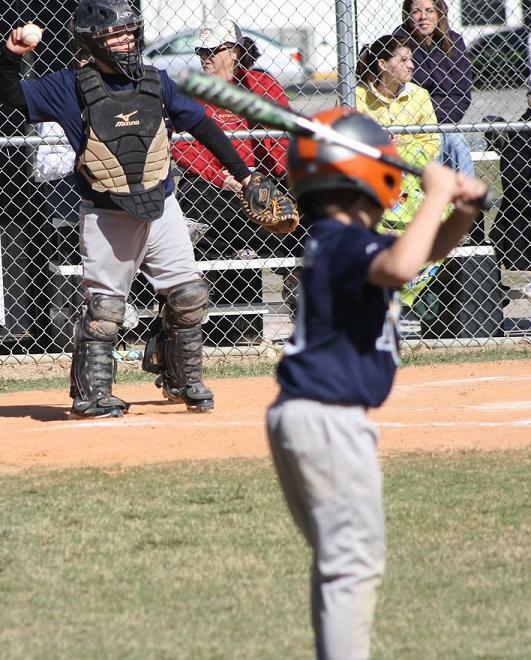 I’ve been struggling with this feeling for years since he joined his first baseball team at the ripe old age of 5. I learned early on to bring something to do while I waited for him to come up to bat or to make contact with the ball when his team was on the field. Every season I pick a new book to read and by the time they’re in the final tournament, I’ve finished the book and I’m finding a place for it in my crowded bookcase. As Jake has gotten older, the other parents have gotten louder. They’re really into the game and watching their kid play. They’re cheering and screaming “Good eye!” and “There ya go boys!” and I’ve got my head in a book. Or I’m on the tablet reading blog posts, commenting, checking my email or playing on Pinterest. I’ll pop my head up when Jake is up to bat and do my own little cheer for my son. See that all you other supportive parents? I’m paying attention … well sort-of. Last year, Jake was in another league where he was one of the older boys. He hit the ball more, got on base more often and he even started pitching most of the innings. Those days, I would pretend to pay attention by staring at the field but that always turned into me daydreaming and getting lost in my thoughts. What? Ah crap … what just happened? Now he’s in a league with 9 – 11 year-old boys. He’s one of the youngest and thanks to my genes, the shortest on the team. Most of the boys have been playing in this league for awhile so Jake’s stuck out in left field. And if I don’t get there in time to get a good seat, I can’t see Jake out there unless I stand up and block the other parents. Some days I hear, “Hey mom, did you see me stop that ball and throw it into first?” Yeah honey … I saw your arm and the ball go flying. Good eye. Don’t get me wrong about this … I truly see all the good in being in little league. The exercise, learning how to be on a team and how to get along with different kids. I’d be thrilled if he can keep playing baseball into high school. The idea of having a coach tell him to keep his grades up or he can’t play instead of his mom … well that’s just genius for any parent. Don’t forget the potential for a baseball scholarship to help his mother with those college expenses. Maybe I’m getting ahead of myself here but a mom can dream, can’t I? But right now, I’m just not into the game. I’m watching time slip by on my watch and wondering if this is the last inning so we can go home. I want to say, I’ll adopt Jake as his grandmother and go to all the games. I love baseball and know and understand what the other parents are up shouting about! I would do this, if you lived closer to me. There are city ball fields right next to the park where I live. My granddaughter used to play there. I went to her games. I yelled and screamed. I told the coaches they didn’t know the rules of the game, and they didn’t! As a result, I ended up coaching…. must be careful not to get too involved again! If you understood the game, maybe it would help… or do you? You are more than welcome to come to the games. Just let me know when you’re heading to my end of town and I’ll let you know when the game starts. Now I am going to pile on some guilt. When I was in little league, I really liked when my parents were there. I loved having them cheer me on. Also, nether of my boys is so into sports. I wish they were. I would love to watch & cheer for them. So – keep going & be supportive. Are you guilting me now? Man, where’s the support? I get the support stuff and that’s why I’m at every game. In my own defense, I’ve seen a few moms checking stuff like fb on their phones and checking emails. But I’m not seeing any of them with books …. You don’t have to stare at every play but it is a good thing to keep going. It would be nice to pay some attention. When I began to go out with my now husband he was very involved in Gaelic football,,, Yawn. I used to go to the matches and sit in the car listening to the radio.Then with five minutes to go I would go and see the match but more importantly I would listen to the spectators so I too could comment on the match when I met up with my footballer again! I am only marginally better as a mum. Now that’s funny! I wish I could get away with sitting in the car but my son already notices when I’m on the tablet or reading. If I disappeared like that, there would be way too many questions. I just need to figure out how to deal with this as I suspect we have many many years of this ahead of me. As long as you are faking it, you’re doing just fine! I think almost every parent has been there! I appreciate the support. I was feeling bad that I was really so freaking bored. Oh no. It is boring. It’s insanely boring! It’s painful cause it’s so boring! Lol. But the fact that you are there is all that matters! « Sunday Funnys: Are you an alien?